Zetsche: Apple's strategy? No idea. Daimler CEO Dieter Zetsche can't figure out why Apple would want to be an automaker. "I do not know the strategy of Apple: It is not that easy for me to understand why they would be interested in entering the auto industry," Zetsche told CNBC at the Geneva auto show last week. Apple offers CarPlay, which projects an iPhone's navigation, music and messaging apps onto a car's navigation screen. But speculation has been building that Apple could produce an iCar as early as 2020. "I don't see a battle [with Apple]," said Zetsche, "but I do see a huge opportunity by these two worlds converging between the automotive industry and the tech world on the West Coast, if you want. There are tremendous new opportunities: the connected car, the autonomous car, the very safe car. "All of these opportunities are lying ahead of us, and we will exploit them in any form." Indeed, could Apple and the maker of Mercedes-Benz models team up on such things? 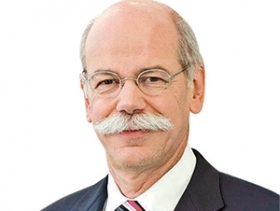 Said Zetsche: "We are open."